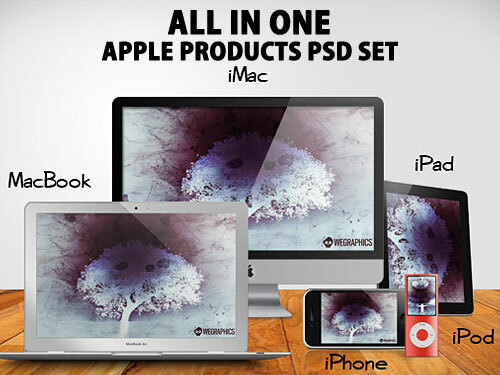 Many designers love to show how their design look on Apple products. We often see site previews displayed on MacBook illustrations, in particular on web designers portfolios, or wallpapers previews on iMac and the new iPad. From here the idea to release this exclusively freebie: 5 illustrations of the best known Apple product: iMac, MacBook, iPhone, iPod and iPad. All the items are super easy to customize, and contain instructions on how to place your own design. Download and enjoy!